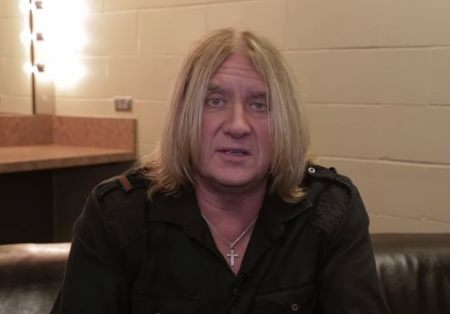 Def Leppard band members talked about their current self-titled studio album in various interviews following its release on this day in 2015. The band's tenth studio album of all original material was released one year ago on 30th October 2015. Read some excerpts from various interviews, including quotes from the Classic Rock Fanpack magazine in celebration of the first anniversary. 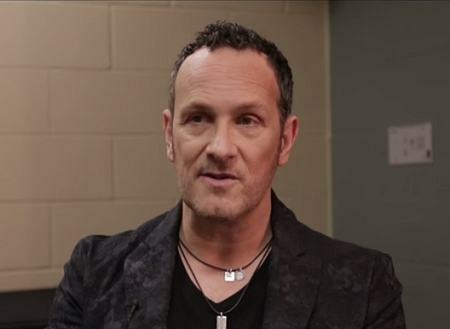 All five band members recall how the album came together and its recording process. 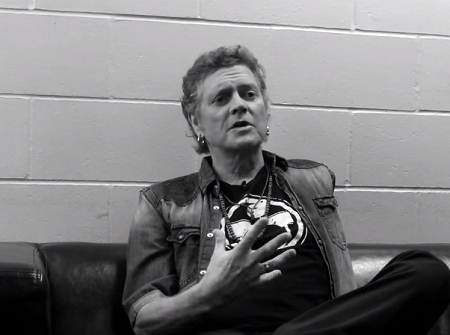 Most of Rick Allen's quotes date from early to mid 2015. Read a First Anniversary special about the album with links to all the interview/promo videos connected to its release. Visit the Album News section. This section includes every news story about new music dating back to early 2011 and all mentions of plans for a follow up to the current album. "We wrote three songs, and they sounded so good we just kept going. When we got to twelve songs, we knew we had an album." "In February 2014. We got together for the whole of that month. We banged those twelve songs out, then left t alone for a bit. We did the tour with KISS. We got back together in May for two weeks to work on those twelve, and we ended up with two more. Then we had another break. So we did six weeks of crafting the songs, then we started working on what we'd got - figuring out the vocals, finishing the lyrics." "The last two tracks on the album, Wings Of An Angel and Blind Faith, were written by the whole band - all five of us together in one room. But mostly we write on our own. Without wanting to sound poncey, we are all songwriters in our own right. We write differently when we write individually, and we write a certain way when we contribute to each other's songs. We're like Queen in that respect. I'm not saying I think we're as good as Queen - we're totally different. But what we do have in common with them is we all write individually. What that gives us is a massive amount of variety in our songs. And that really matters to us." "We know how to make a great record now - on our own terms. In our own environment, without having to bring in the big guns. We've got this dialled in. We can do it all ourselves, and it's a good way to work. It's very different to walking into Abbey Road with all the gear." "Ronan's been working with us for sixteen years, since the Euphoria album. He's a phenomenal engineer and now co-producer. He produced the Down 'n' Outz albums with me. He knows how to referee. He's our guy." "We took eight or nine weeks to record but that was over a period of nine months. We did it all in house, and I think you can hear it in, dare I say, the grooves. There's a natural feel to the record. We didn't rush. We weren't in there seven days a week, twenty hours a day, like we used to be." "Eleven in the morning till eleven at night is what we normally do. But when I say we start at eleven, that's when we meet in the kitchen, drinking coffee, making toast, then drifting into the studio to see who's got what. That's the template. If we've run our course by nine we quit, we're done for the day. And then there are times you do want to start a new one at the end of the day. We just ran with it. We just went with the vibe. But you're right - gentleman of a certain vintage can dictate their own terms, especially when you haven't got a record company hanging over your head. We did 95 percent of the album at Joe's Garage. Phil did some solos at home. And then we did a bit of work on various laptops while we were touring around the world." "Not really. And in that sense, it was no different to when we did Hysteria or Pyromania. It's not like the five of us were in the room the whole time. I was never in the studio for any of the solos that got recorded for any of those records. Why would I be?. A guitar player doesn't need the singer hovering around when he's trying to do a solo." "Vivian was there for the whole month when we did the original twelve songs. He wasn't there for the second two weeks while he was having treatment. We carried on. We said: "Okay, Viv will catch up" Once we'd got the tracks down, Viv could do his parts on a laptop later on." "It was something that was obviously hanging over him, but it wasn't like a shadow over us. The truth is, we never talked about it much. The feeling within the band was: "Okay, he's got cancer and he's having treatment - there's nothing we can do." The important thing was that Vivian was in good shape, he was smiling and happy and playing well. And during the period when we were making our album. Viv was also doing his Last In Line album,. Jesus, he's got more energy than most people that don't have cancer." "It was Phil who said: "I think we should just call the album Def Leppard," I said: "Well, we've never done that in 35 years, so why not?" And really, it's an album that defines what this band is all about. It's got every kind of song that we've either wanted to record or are familiar with. There are songs like Let's Go and Dangerous that are classic Def Leppard. We've not going to shy away from what we're good at. But there are all these other songs where we're going off into new directions, stretching our wings." "Well, I hate to keep using Queen as a reference point, but we'd much rather be in that Queen bracket - where you have the ability to do Seaside Rendezvous as well as We Will Rock You - as opposed to Back In Black, where everything is in that one style. I'm not saying that negatively,. I love AC/DC. We all do. But we've got the slow songs that they'll never do, and the harmonies. I hear Queen in certain songs on this album, and Zeppelin in others. But we've never been afraid to wear our influences on our sleeves, and with this album we didn't shy away from admitting these things to each other's faces. It's not like we're copying, but at times one of us would say they'd got this song that sounds a bit like Zeppelin, or KISS, or AC/DC. To use that reference, it makes it so much easier for everybody to understand where you're coming from. It's like the Rolling Stones, Keith saying to Mick: "I got this song that sounds like Muddy Waters." I bet they must have said that a million times, We all do it." "To me there's certain things that we created back in the day, a way that our drums are played and sound, a way that the guitar parts are structured, there's a way in which me, Vivian and Phil sing together and harmonise with each other in conjunction with Joe. They're the main things that make a Def Leppard album sound like Def Leppard. All those things are very much in existence on the new album." "The songs are very much varied though. We're not stuck on a wheel like we were with Hysteria and Adrenalize. And even Pyromania, to a certain extent, where every song is given the same treatment. With the new one, it's much more varied. It's a wider album. Not all of the same ilk, but with with all of the same ingredients. It's having the security within the band to say: "I want to write this kind of song," And as long as they still have those vital ingredients that we formulated in the 80, it will be all right. So to us it sounds like a Def Leppard album. No question about it." "Over the years we've done different versions of concepts of how you approach an album, but with this one it just flowed. We went in to do a single and we came out with twelve songs. There wasn't one time on this record when a single person went: "Well, I don't think that worked..." Or: "Maybe we shouldn't try this because of that..." which is what we usually have. This time it was pure inspiration, pure flow. Some of the songs, although they sound unmistakably like Def Leppard, are in totally different styles to what we've done before. Normally that would have been a spanner in the works. Here, it was: "That sounds great." And we kept going." "I can honestly say it's the best one I've done with the band. We've called it Def Leppard because there's never been an album from the guys called that before. It's about time!. There are 14 tracks, and it's definitely very diverse - the most varied one the band have ever done. For instance, the last song on there, called Blind Faith, is very psychedelic. That's something the band haven't attempted in the past. There's also another first on the album, a track where all the band members sing lead during the verses." "There are the usual rockers and ballads as well,. But for the uptempo ones, this time we went old school and played these live in the studio together. It's something we've not done for a long time, and it helped capture the energy and feel of the music. Mind you, other parts were then overdubbed, and sometimes I think the final mixes are slightly too polished. 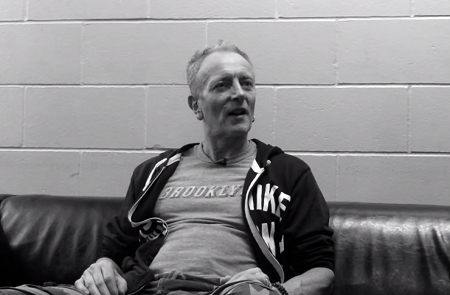 But they do have that unmistakable quality which is so associated with Def Leppard." "We did it over a period of a year, but in three different sessions. Each one lasted about four to six weeks. But because of my illness, I could only get involved with two of these - the first and the third. That meant I really didn't feel fully involved. It was as if I wasn't part of the band for much of the recording. I have to stress that's got nothing to do with the other guys' attitude towards me. This hasn't changed at all. It's simply come from me, cos I had to miss so much of the process." "Well, this is where I disagree with the way the band do things. They intellectualise the process of doing an album. There are lots of discussions in the studio, analysing what they're doing and taking it apart. I much prefer going in and getting straight on with playing. But this is the way the band have done things for so many years, and it's clearly worked for them, as you can tell by their back catalogue of success. So why should they alter anything now?. And I wouldn't ever dream of suggesting we should do things differently. 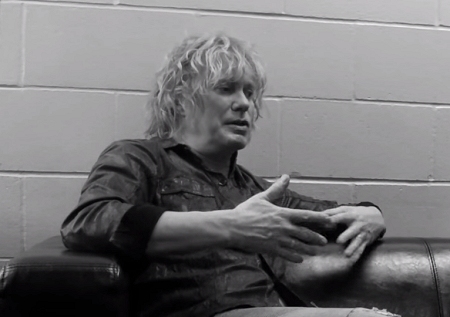 All I would say is that I did things a lot more spontaneously on the Last In Line album." "I love it. It was great making this record. You know we spent a lot of time together. We did three really concentrated sessions together over the course of last year and a little bit into this year. You know it was great just all sitting down in the same room and figuring these songs out. It's nothing really to do with who did what or what material came from where. It was more the fact that there was this camaraderie while we were doing it and I think that really comes through in the songs that we came up with." "We carved out like three good long sessions where we all got together. And within those time periods we were able to put about 16 songs together and as of right now they're probably more or less about 85 to 90 percent finished. Some of them even more so. Some of them are just about ready to present you know. So we're really excited about it you know it's been a - it's been a really nice project. It's been good getting together the way that we did in the studio you know. Over the years we tended to rely more on technology and sending you know - sending files to one another. You know for the other person to - to finish off. You know where somebody could but actually getting together in a room and all being together in that way is incredibly you know - incredibly valuable and really creative." "I think it's a wonderful mixture of everything that inspired us and everything that we've done. So I think people will hear many, many different influences within the music that they hear." "Ronan McHugh. He's produced quite a few records over the years and he also does our live sound. So we spend a lot of time with Ronan. And I think because he knows us so well. He's to a point now where he just kind of knows what we want. And you know everybody has an input and there's always - there's always room for improvement or you know a certain perception of how you want it to sound. And he's the guy that is able to translate you know whatever it is we want into the finished thing. So we're very fortunate to have Ronan." "You know what I have to mention the latest one because, you know, because of the way that it came together. We went in just to do a couple of songs. We ended up putting down 15 songs. And we loved all of them." "We weren't afraid to just express ourselves. We were like you know what if we don't do it now when are we gonna do it. And it was like all the influences you know. I mentioned David Bowie earlier. Huge influence on Def Leppard. Queen. Mott The Hoople. Sweet. Slade. You know all these different bands that we grew up listening to. And it was a great opportunity for us to let the musical influences really shine. And let those come through." "Well, we got together really just to write a few songs. We weren’t interested, really, in writing a whole record. But then when everybody brought their ideas to the table, we realized that we had 12 or 15 ideas that were in a state of being finished." "And we were all in the same boat – it was fantastic, you know? Just being able to be in the same room and come up with songs that we felt were just really strong. 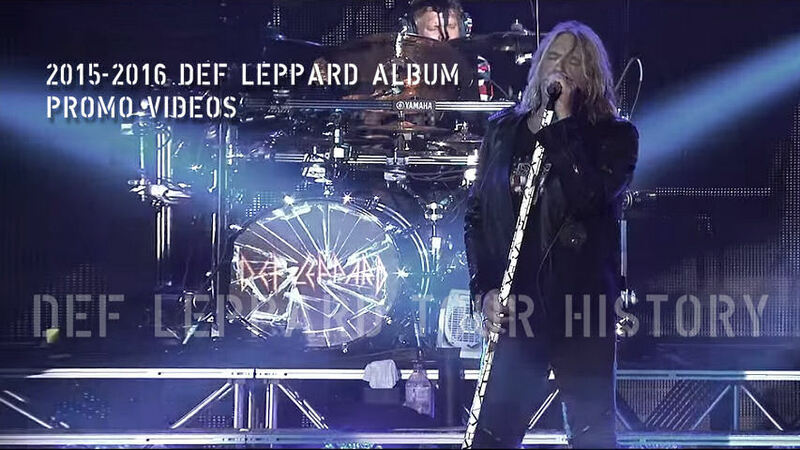 And right now we feel as though we ended up with a very classic-sounding Def Leppard record." Watch all the related album videos so far on this YouTube playlist.